Ever ask a friend or co-worker to write you a coveted LinkedIn recommendation, to boost your online business profile? It’s up there with pulling teeth. And when someone does write a recommendation, chances are they’re a close colleague or friend, not a random LinkedIn connection that you’ve never met. A&W Restaurants saw an opportunity in this space and created a LinkedIn profile for its mascot, Rooty The Great Root Bear. Rooty’s LinkedIn page launched last week, and so far 22 recommendations have been sent. 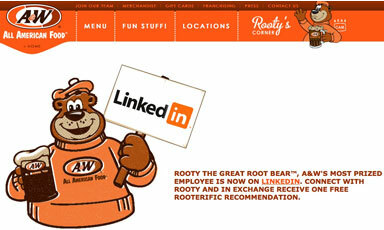 Presently, Rooty’s LinkedIn page isn’t being promoted; the page is part of a larger campaign for A&W. The brand recently launched a new website where it expects users to find out about Rooty’s LinkedIn page, as well as via word of mouth on LinkedIn.